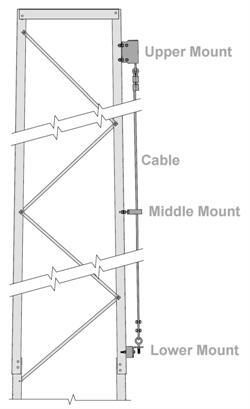 ROHN TTRSL100 Safety Cable Systems are designed for use on RSL Series towers from 60 to 100 ft. in height. ROHN's TUF TUG Safety System is an industry standard wire-cable tower safety device. ROHN TTRSL100 climbing cables meet OSHA requirements when used with an approved climbing harness and wire-grab attachment (sold separately).